From 1798 charities were set up for clothing and educating sons of needy Freemasons. They originally provided education by sending them to schools near to their homes. A specific masonic boys’ school was set up at Wood Green in North London in 1857 following amalgamation of the charities in 1852. A new school was built in Bushey, Hertfordshire in 1903 and a Junior School was added on the other side of The Avenue in 1929. By 1939 there were 800 boys at the school. Fee paying pupils were admitted from 1958 and day boys from 1966. Following a decline in pupil numbers the junior school closed in 1970; the site is now occupied by Bushey Hall School. Numbers continued to fall, and the senior school closed in 1977. 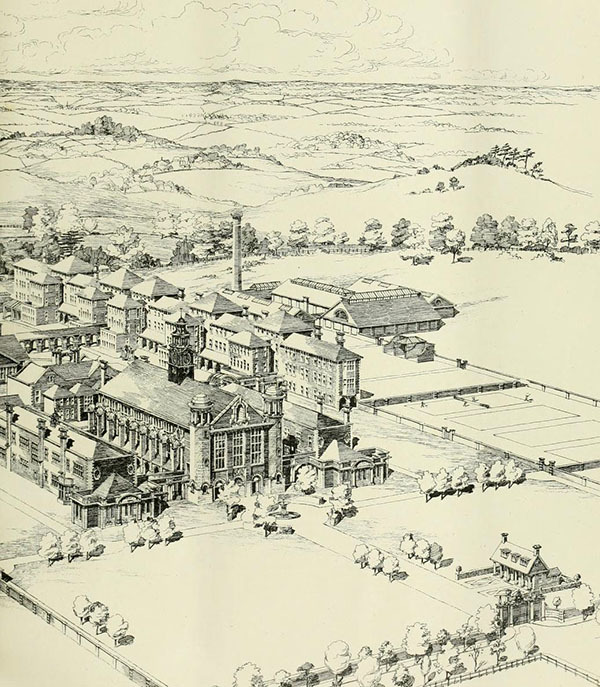 For a time, the buildings housed the United States International University (Europe), and later became a film set. They have now been redeveloped as luxury housing. “It is inteniled to erect new schools at Bushey, Herts, as a memorial of the centenary of this institution, the requirements having outgrown the existing huildings at Wood Green. With the general approval of the subscribers, the board of management purchased the Bushey Grove Park Estate of about 67 acres in extent, and has devoted much labour to its development. The site is an admirable one, having an area of 6.5 acres, with roads on all sides, the general soil being loam with pebbles therein, and possesses a level plateau, standing high, upon which it is proposed to erect the buildings. Having given full consideration to the future requirements as well as the immediate necessities of the institution, with the valuable assistance of W. Bro. Rowland Plumbe, F.R.I.B.A., P.G. Supt. of Works, the board prepared a schedule of conditions and accommodation required, and invited six firms of architects to submit designs in a limited competition. 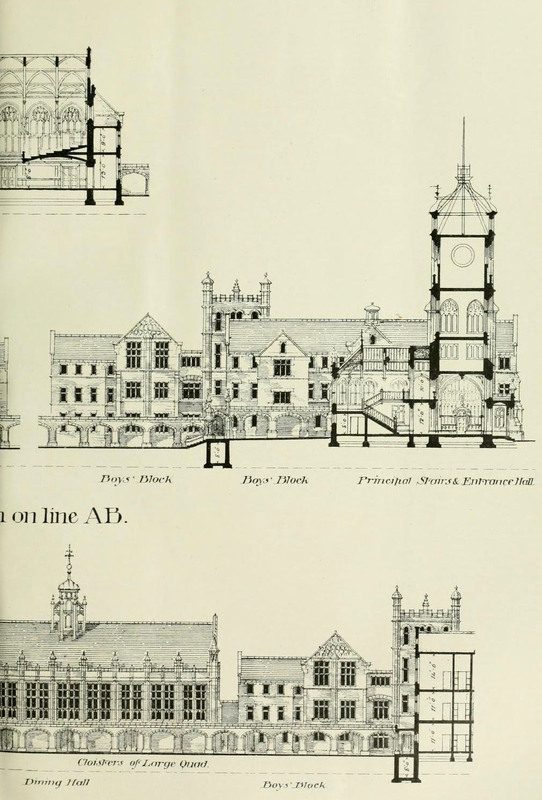 The designs were most carefully adjudicated upon by the assessor, whose award met with the unanimous approval of the board, and the plans placed first in order of merit were submitted to the Quarterly Court in .January last. 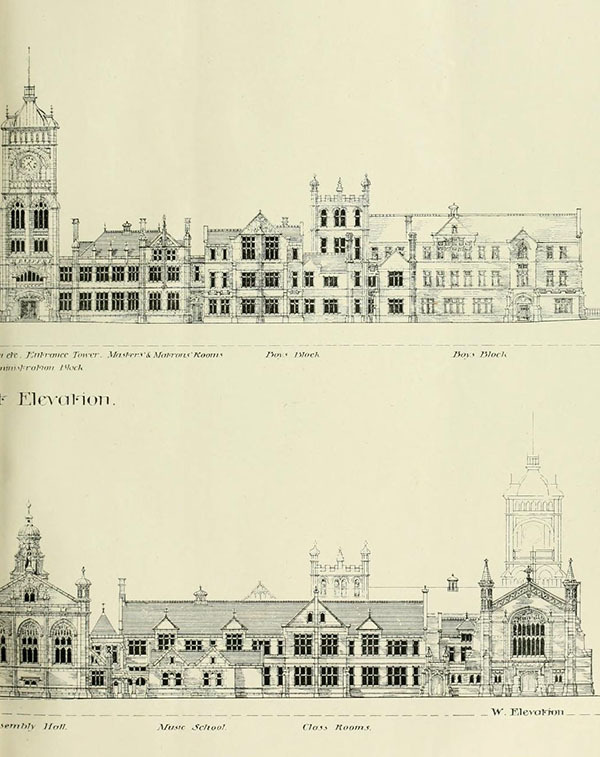 The authors of the designs were found to be Messrs. Gordon, Lowther, and Gunton, of Finsbury House, London, E.G., and these brethren are now engaged in preparing the working drawings and quantities. It is expected to have these completed and the work on the buildings commenced in the autumn. The designs show a complete arrangement for a school of 500 boys ; but it is proposed to build dormitory accommodation for 400 only at present. The administrative offices, halls, &c., will be adapted for the greater number, so as to avoid expense in alterations, &c., in the future. It will be seen from the accompanying plan that the general scheme is quadrangular, placed so as to secure the best possible aspects, the administrative block, with its central tower, occupying the principal or south-west side and facing the main road and entrance. This block contains the museum and library. 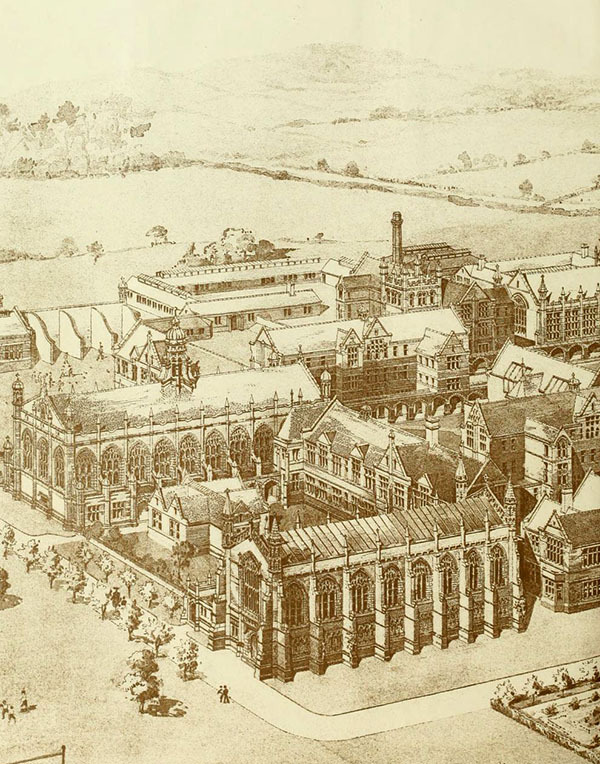 The Educational block, with its separate quadrangle, containing the assembly -hall, the music-school, the various arts and physics schools, classrooms, together with the chapel and head-master’s residence adjoining, are placed on the north-west side. 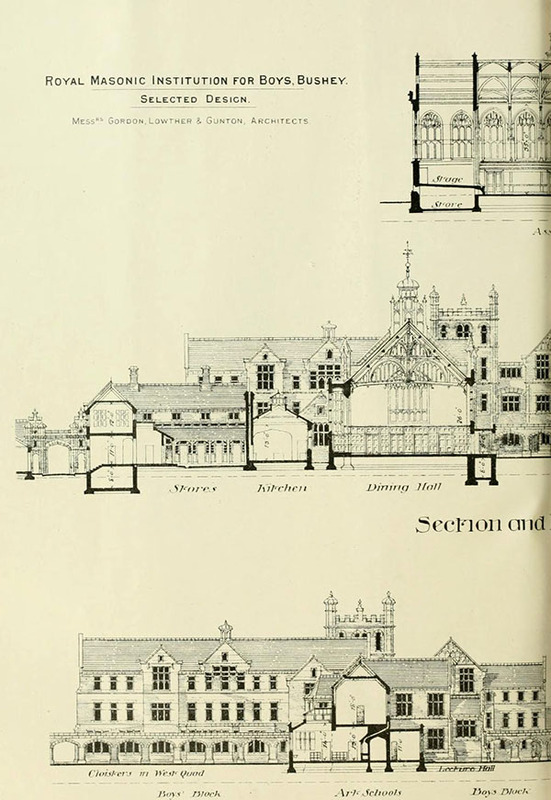 The north-east side is occupied by the dining-hall, the kitchen and service department, with its separate courtyard ; and beyond this the technical schools, swimming-bath, gymnasium, and fives-courts, ire, are placed. The south-east side is left partially open for the present, with a view to the erection in the future, if necessary, of an additional residential block. 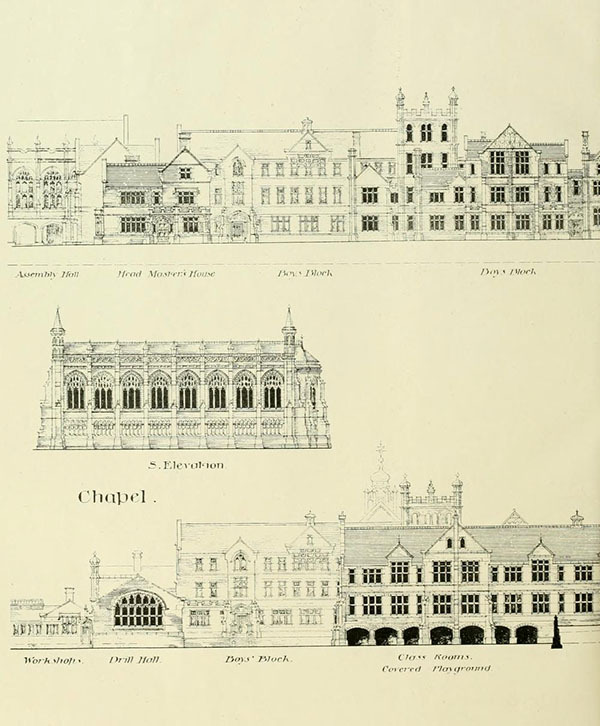 The residential blocks are placed at each corner of the main quadrangle, and arranged to accommodate 100 boys, each block comprising two houses with day-schools, dormitories, and masters’ and service-rooms, complete .\ main feature of the design is that all the principal blocks are connected by cloisters and subways, and are provided for dome.stic service. 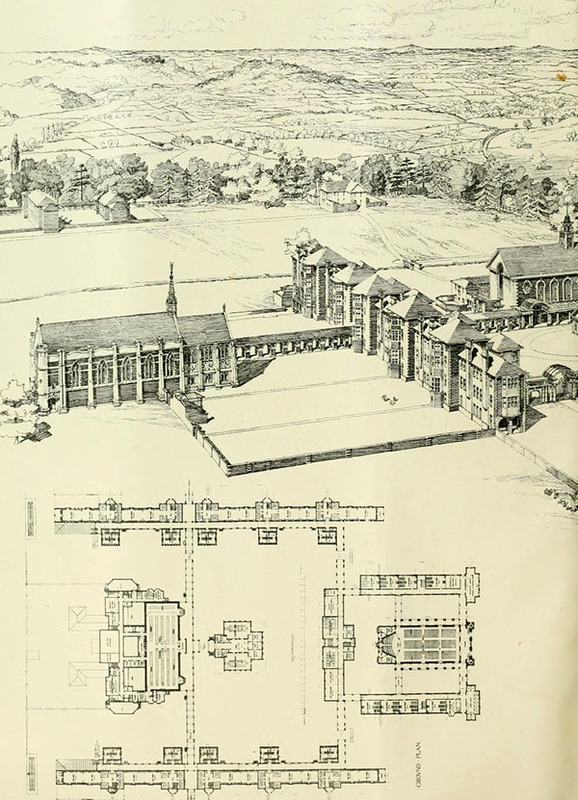 It is proposed ultimately to erect a sanatorium for 6O boys, as well as an infirmary for 2.5 cases, the former at the extreme north corner of the site, so as to be placed as far as possible from the school building, and the latter at the extreme south, each having separate approaches from the main roads. The playing-fields” and tennis-courts are placed to the south and west of the site, and the former are overlooked from the master’s residence. 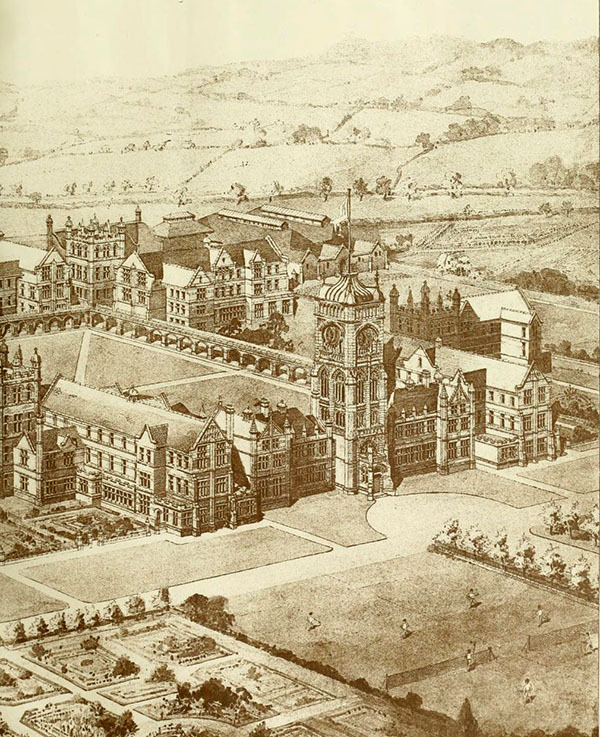 The heating to the buildings will be by means of hot water on the low-pre.=sure system, with ventilating radiators for the admission of warm, fresh air, in conjunction with Tobin’s tubes, the exhaust ventilation being effected by means of fans placed in the turrets, and connected with horizontal trunks in the floors and ceilings, and rising flues in the walls, fitted with automatic valves.